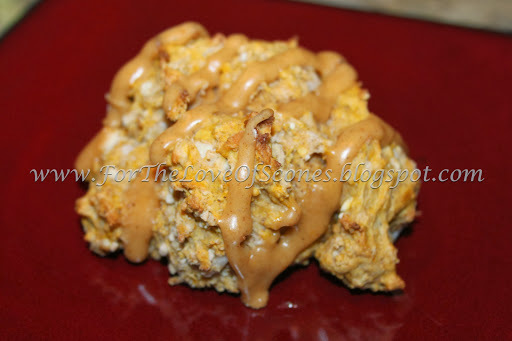 What could be more fall than pumpkin scones? Really, without pumpkin spices, pumpkin is just a rather bland squash, but throw in some cinnamon, nutmeg, ginger, allspice, cloves…oh, and a bit of coconut perhaps, and you’ve got a winning combination. 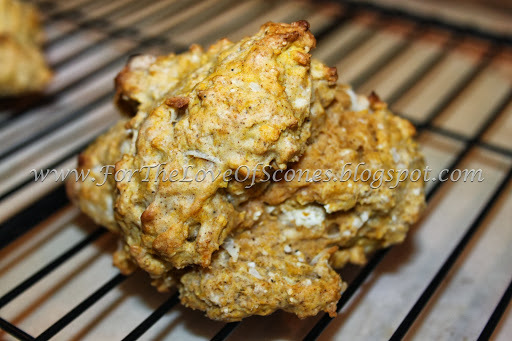 I really enjoyed this latest pumpkin creation…it’s a thicker scone, not the typical buttery and flaky scone, but full of great, complex flavor. 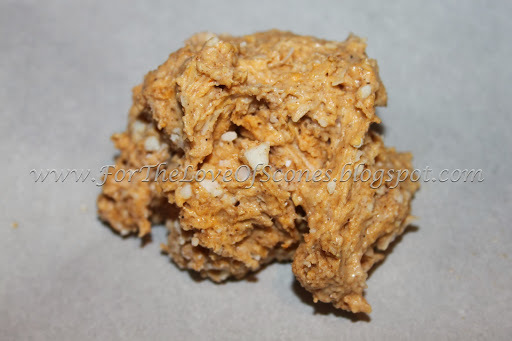 To pump up the coconut flavor, I added some powdered coconut milk and replaced unsalted butter with coconut butter (dairy free), as well as a bit of coconut extract–along with my sweetened, shredded coconut. 1. Preheat the oven to 450ºF. 2. Blend pumpkin and coconut together in a food processor for one minute. 3. Add 1/2 cup lite coconut milk, vanilla, and coconut extracts to the food processor. Blend an additional one minute. Set aside. 4. 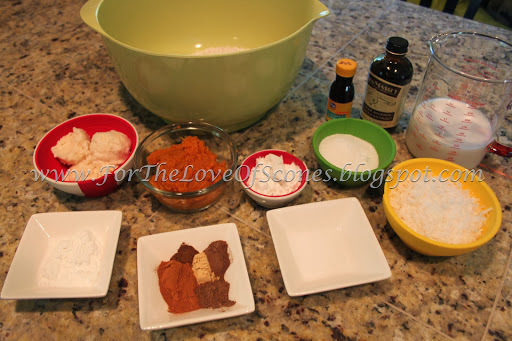 Whisk together flour, baking powder, sugar, salt, cinnamon, nutmeg, ginger, allspice, and sugar. 5. 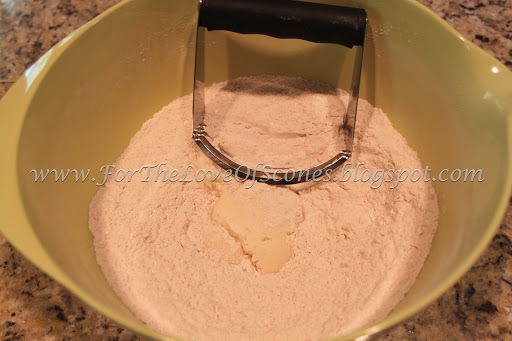 Add butter and, using a pastry blender, work into the dry ingredients until the mixture resembles coarse sand. 6. 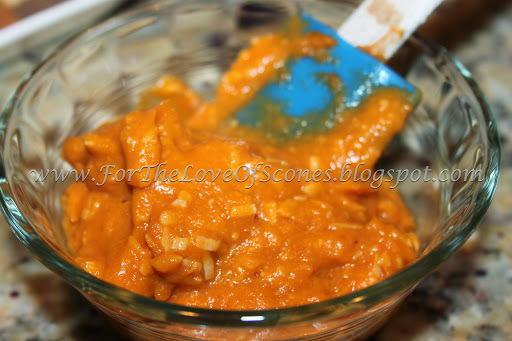 Add pumpkin puree, coconut, coconut milk mixture to the dry ingredients and mix well with a wooden spoon. 7. 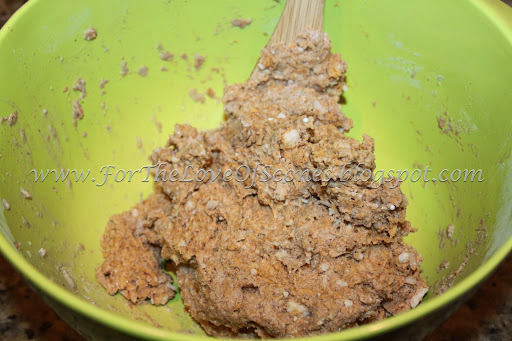 Add additional coconut milk mixture to the dry ingredients and stir to mix with a wooden spoon. Should be slightly wet dough. 8. Spray a 1/3-cup scoop with vegetable oil/cooking oil, and use to scoop out and shape scones. Flatten slightly to speed cooking, but you can leave alone “free-formed.” Should make about 9. 9. Place on parchment-lined baking sheet and bake at 450ºF for 10 minutes or until darkened on top. 10. While the scones bake, prepare the glaze. 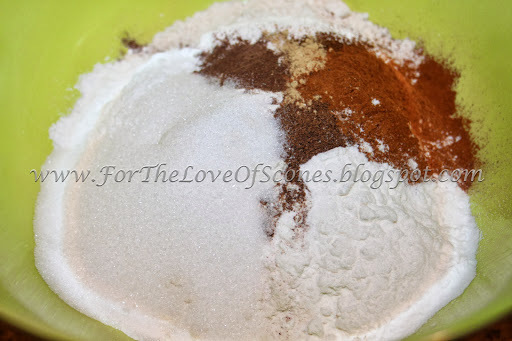 Sift the powdered sugar into a bowl and add the spices. Add 1 tbsp coconut milk to the pumpkin puree along with a splash of coconut extract and whisk to mix. Add the pumpkin mixture to the powdered sugar mixture and whisk to combine. Add more coconut milk if needed. 11. When the scones have cooled a little while, drizzle the glaze over the top in a zig-zag pattern. Allow the scones to cool, and the glaze will set. 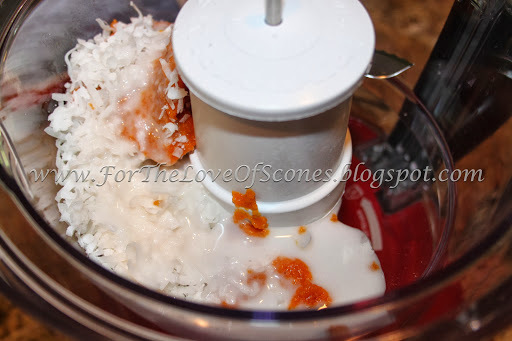 In a food processor, combine some of the coconut, the pumpkin and some coconut milk. Add butter and mix in with a pastry blender. 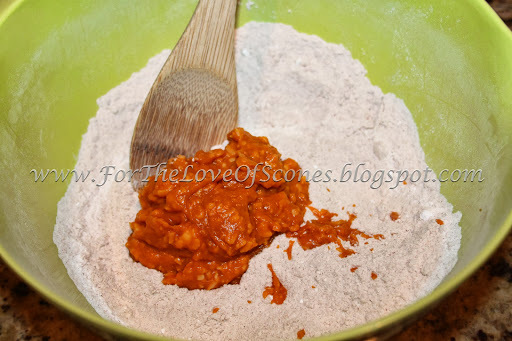 Add pumpkin mixture to the dry mixture and combine with a wooden spoon. 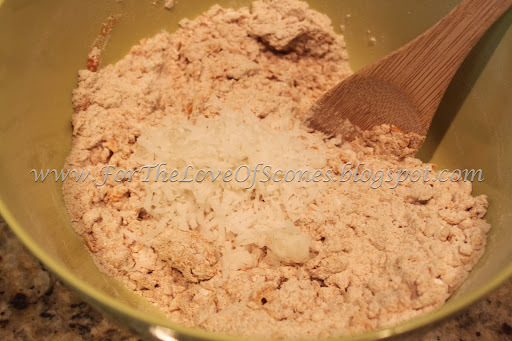 Add the remainder of the coconut and mix well, breaking up any clumps. Add the coconut milk and combine. The dough should be slightly sticky to the touch. Use a 1/3-cup scoop to form the scones. When the scones have cooled for a few minutes, drizzle with the glaze. I really enjoyed these scones. They are full of coconutty flavor along with pumpkin and fall pumpkin spices. 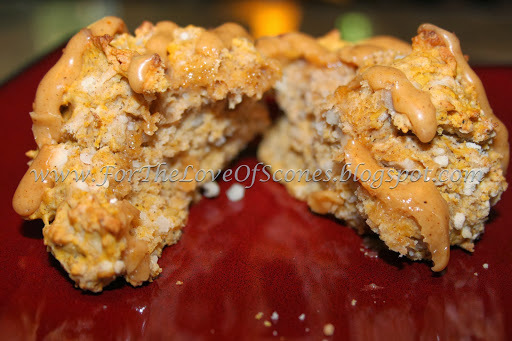 The glaze really adds a sweetness and punch of pumpkin to the scone which sets the entire experience off. A word of warning, these are not light and flaky scones, but more dense scones that are practically a meal in themselves.